In a global context, the United States remains a young country. For most of our existence, we have lived in relative economic isolation. Socio-economic development has occurred in the U.S. in three stages. First was the Agricultural Age, during which wealth was defined as ownership of land. Second was the Industrial Age, during which wealth was defined as ownership of capital often in the form of manufacturing facilities. We are now in the Knowledge Age. Wealth is now based on ownership of knowledge and the ability to use that knowledge to create or improve goods and services.Killeen’s socio-economic future will depend upon its ability to understand and capture opportunities presented in the Knowledge Age. During the 19th, and much of the 20th Century, economic development consisted of three elements. One of the elements was business with a need to expand. One of the elements was labor, in many cases untrained, supplied by a growing population. One of the elements was infrastructure provided, in many cases, by aggressive communities. Infrastructure consisted of adequate sites, often in an industrial park operated by a quasi-public organization, available buildings, adequate utilities, reasonable construction costs, favorable tax rates, and other factors under the community’s influence. The payoff for the community was more jobs, often any kind of job. Because we lived in a relative isolated economy, the competition for business was usually next door or down the road. In most cases, not far away. Economic development began to change in the early 1980’s with the convergence of several events including: the development of, and access to, computing power; development of the Internet, the development of robust, global telecommunication networks, the expansion of trade agreements, and the emergence of the global economy. In the span of a relatively few decades, the world has changed. Where we had been participants in an economy with fixed borders, we are now participants in a global, borderless economy where the competition for capital investment is not only next door or down the street but around the world. What does this mean for the U.S.? What does it mean for Killeen? In many instances, we are no longer the producer of choice and we may no longer be the service provider of choice. These decisions are made by the customer on the basis of costs and availability. It is a fact that offshore competition may offer a better deal to the customer. So, what is the answer? How do we grow Killeen’s economy in the future? How do we insure that our children continue to enjoy a quality standard of living? Rebuilding barriers to protect us from the outside world might sound like an option. It is not. The rest of the world will simply continue to develop without us. The answer is, to some extent, in the past. Killeen has a history of rising to the challenge. Just as we have collaborated with the U.S. Army to make Fort Hood and Killeen “The Great Place”, we will rise to this challenge as well. We do what we have always done so well. We will collaborate and adapt. The answer is a new economic development model. provide a product in an unconventional way like Michael Dell, of Dell Computers, or a software service like Bill Gates, of Microsoft, or an information service like Sergey Brin and Larry Page, of Google. Talent is the second element. It is defined as labor coupled with education, creativity and innovation. Talent is ever evolving to keep pace with technical development. In the new economy, talent is often referred to as the knowledge worker. Talent, as expressed through knowledge workers, has the ability to use knowledge to create or improve goods and services. The knowledge worker has an acquaintance with, or understanding of a science, art or technique. Knowledge workers include those in the information technology fields, such as programmers, systems analysts, technical writers, academic professionals, and researchers. The term is also frequently used to include people outside of information technology, such as lawyers, teachers, and scientists of all kinds. It is a fact that knowledge workers are now estimated to outnumber all other workers in North America by at least a four to one margin. There is something else about these knowledge workers. Because they are technically savvy, creative and innovative and because they reside in a global economy, they have learned to, literally, work through the wire. That means they are mobile. Today’s talent can live anywhere, work anytime and achieve unprecedented output. 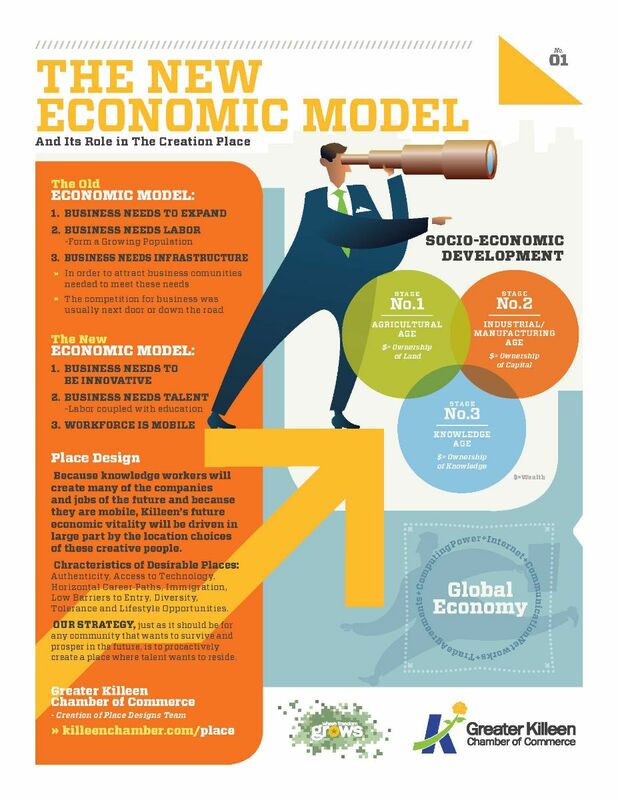 It is this mobility that leads to the third element of the economic development model of the future – that is Place Design. Because knowledge workers will create many of the companies and jobs of the future and because they are mobile, Killeen’s future economic vitality will be driven in large part by the location choices of these creative people. Fortunately, we know a great deal about what knowledge workers are seeking in a place. Recent books on the subject, such as The Rise of the Creative Class, by Dr. Richard Florida, have researched and documented that there are eight characteristics present in desirable places. They are Authenticity, Access to Technology, Horizontal Career Paths, Immigration, Low Barriers to Entry, Diversity, Tolerance, and Lifestyle Opportunities. Young Professionals refer to places that have these characteristics as “cool communities”. In fact, Rebecca Ryan, in her book Live First, Work Second, lists the seven indexes of a cool community as seen by young professionals. They are vitality, earning, learning, social capital, cost of lifestyle, after hours, and around town. Every community is unique. Every community has the eight place characteristics and the seven cool community indexes in varying degrees. Every community can take steps to change. important is to improve our quality of place. By focusing on plans to develop the eight characteristics of place design and the seven indexes of a cool community, we will attract talent. That resident talent, will, in turn, help us create the companies and jobs of the future. This is the new economic development model. It is one we had better come to embrace. Much depends on it.